If you have noticed that a pipe at your place is leaking, then you can be sure that the problem will only get worse. 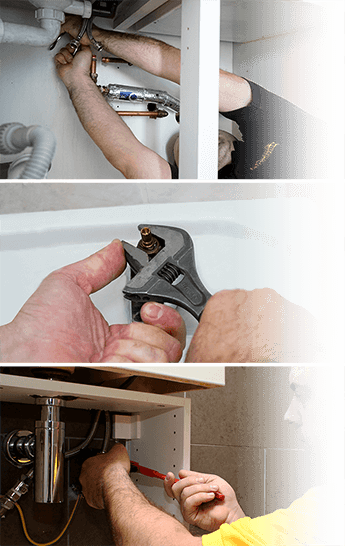 So act now and call in skilled and fully equipped London plumbers to take care of the problem for you. We have all the right tools and knowledge to fix pipes, taps, drains, and anything else related to plumbing. Each Fantastic Handyman has a considerable professional background. They work quickly and with precision. You can be certain that they will handle your plumbing problem the right way. Also, the handyworkers would never cause a mess at your place. The work area is left neat and tidy every time. We monitor the work of every handyman to ensure their performance remains at high professional level, and that you are happy with the services you get. That is why your feedback is incredibly valuable to us. Each plumber has all the necessary tools and equipment to take care of your problem. However, plumbing jobs often require the replacement of parts. We are able to provide extra materials and replacement parts but please note that they count as additional charges. We believe in pricing that is fair for both you and the technicians who do the work. This way everybody wins. In other words, you are only paying for the actual time the job took to be done. The minimum charge is for one hour. After that, you are charged for every additional period of 30 minutes. We’ve got a Safety Policy which ensures that both the employee and the customer are protected. Also, each plumber carries Public Liability Insurance of up to 5 million pounds so no need to worry about accidents. The plumbers are ready to help you 7 days a week. Even on weekends, with regular price rates on Saturdays. You can book your plumber immediately by using the online request form or the GoFantastic app! Also, you can speak with us by calling or by starting a live chat.